due to a non-foundation-related plumbing problem. Regardless of the source of the seepage, drainage collecting beneath a home will always cause damage to the foundation and basement structure. Damage from drainage includes watermarks on interior walls and floors, water damage to furniture, boxes and personal items stored in the basement, and even worse can lead to the rapid growth of mold and mildew. Should you experience flooding in your basement or other area beneath your home, we strongly encourage you to reach out and contact us immediately. 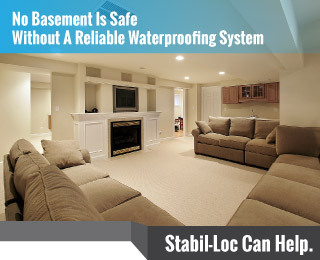 Never step into flood waters because the electrical system in you’re your basement could cause electrocution. The most reliable and recommended solution to eliminate the possibility of standing water below your home is the installation of an Stabil-Loc drainage system. The drain will guide the water into a sump pump. The water collects in the basin of the pump and once it reaches a predetermined level, the water is forced outside, away from your home’s foundation. In the event that your neighborhood loses power during a storm, battery back-up units are also available.